NGC 4449 is a dwarf irregular galaxy of some 19,000 light-years across, located about 12.5 million light-years away in the constellation Canes Venatici. It is part of the M94 Group (the Canes Venatici I Group), a galaxy group relatively close to the Local Group (which contains our Milky Way galaxy). It is moving away from us at about 207 kilometers per second. NGC 4449 is similar in size, shape and brightness, and often compared to, the Large Magellanic Cloud, a satellite galaxy of the Milky Way. 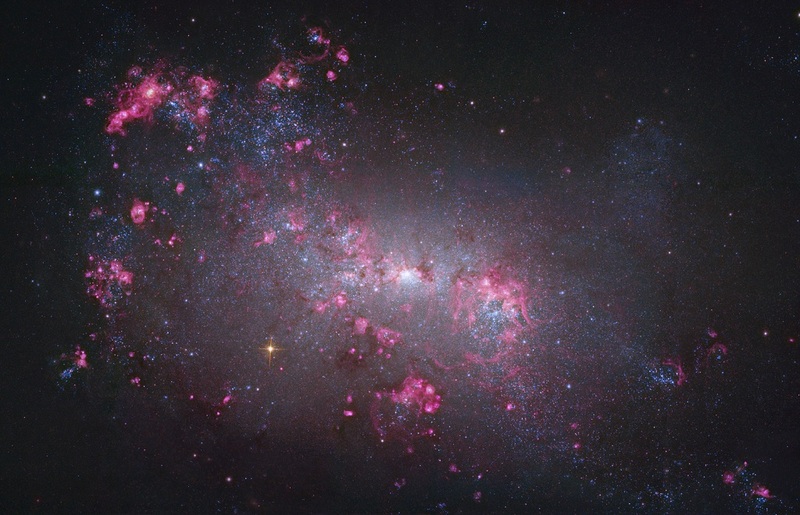 Unlike the Large Magellanic Cloud, however, NGC 4449 is considered a starburst galaxy due to its high rate of star formation (twice the one of the LMC). Its bar consists of a population of stars with an age older than five million years, while the reddish regions in the image are HII regions with embedded ongoing star formation (the reddish emission from heated hydrogen gas is generally a tell-tale sign of active star formation). There are also several large blue star clusters with young, hot and massive stars visible (which will live less than a few hundred million years), some of them near filaments of dust which provide the fuel for future star formation. Radio wave observations have shown that NGC 4449 is embedded in a huge gaseous halo with a diameter of 14 times the optical one, that show distortions and irregularities likely caused by interactions with nearby galaxies. A disk like feature and a lopsided arm structure have been found in its halo and are likely the fossil remains of a merger in its remote past. NGC 4449 most likely had an encounter with its irregular companion galaxy, DDO 125 some 500 million years ago. NGC 4449 also holds the distinction of being the first dwarf galaxy with an identified tidal star stream (not seen in this close-up image) with lots of red giant stars. This star stream represents the remains of a still smaller infalling satellite galaxy, dubbed NGC 4449B, disrupted by gravitational forces and destined to merge with NGC 4449. This is how galaxies grow: the smaller galaxy is coming in and getting shredded, eventually leaving its stars scattered through the halo of the host galaxy. This particular interaction is called a “stealth merger” because the smaller galaxy NGC 4449B was nearly imperceptible, but has a profound effect on the shape of its partner. In 2012 astronomers also found a highly flattened globular cluster with two tails of young stars that may be the nucleus of a gas-rich galaxy being disrupted and absorbed by NGC 4449. With relatively few stars, small galaxies are thought to possess extensive dark matter halos. But since dark matter interacts gravitationally, these observations offer a chance to examine the significant role of dark matter in galactic merger events. These interactions are likely responsible for NGC 4449’s bursts of star formation. This image is based on observations made with the NASA/ESA Hubble Space Telescope, and obtained from the Hubble Legacy Archive, which is a collaboration between the Space Telescope Science Institute (STScI/NASA), the Space Telescope European Coordinating Facility (ST-ECF/ESA) and the Canadian Astronomy Data Centre (CADC/NRC/CSA).